Medical assisting is a rewarding field. Every day, you get to make a positive impact on the lives of others just by doing what you love. 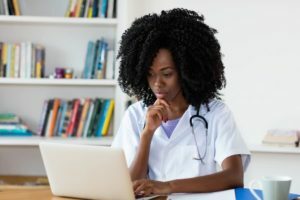 Like other industries, the medical assistant field is always changing, and it can be hard to keep up with all the technological and methodological advancements being made. Fortunately, there are a number of ways you can stay up-to-date on all things medical assisting. And it starts at Prism Career Institute. A medical assistant training program provides the foundation needed for a rewarding career. If you’re hoping to stay on top of the latest with the medical assistant field, enroll in a Medical Assistant program. At Prism Career Institute, our program combines medical education and hands-on training, giving you the knowledge and skills you need to enter the healthcare field and attain continued success. You’ll learn the newest techniques, which you can continue to build on in your future career, and participate in an externship to get real-world experience. Because you’ll need to be recertified as time passes, professional certifications give you the push you need for continuing education and medical assistant advancement. Ready to start a career as a medical assistant? Begin your journey at Prism Career Institute. To learn more about our Medical Assistant Program, contact us today.